Bet Online sportsbook offers a wide variety of deposit options to their American customers. Usually, US-based sportsbooks offer only Visa and Master Card, but Bet Online has something extra for their users. Apart from the above mentioned credit cards, you can make a deposit with Bitcoin, Litecoin and even Ethereum, while wire transfer and checks are also available. Bitcoin and credit cards are the fastest deposit methods, with $50 minimum. When it comes to withdrawals, Bet Online main withdrawal method is check, but the minimum amount you can withdraw with this method is $500. Bet Online didn’t offer Bitcoin for withdrawals until recently, but now you can use this method to withdraw from $20 up to $10000 from this bookmaker. Other withdrawal methods include bank wire and wire transfers. We have to say that Bet Online doesn’t have the nicest looking interface and it is not among the most functional either. 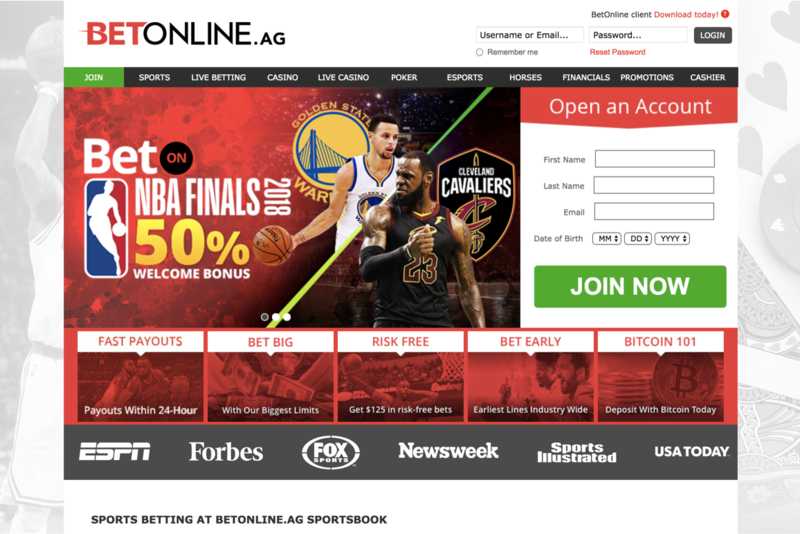 The interface looks outdated, and it was similar more than ten years ago, when this bookmaker went online for the first time. On the left hand side of the screen, you can see a listing of sports markets, which is a standard within the industry. You will have to get used to the bet slip, which differs from the industry standards. The options are different and at first glance it might seem they are all over the place. However, you should give Bet Online a chance and after some time you will get used to it. Bet Online mobile betting platform is much more functional and better looking than the desktop version of the site. The Android app is exceptional and after using it, their outdated desktop website looks even weirder. Bet Online odds and limits are among the best in the business. The platform is casual-bettors friendly, since the minimum bet is only $1. The lines are up early for almost every market, which is a big advantage over some huge betting platforms in the US; most of them are usually late. One of the best features of Bet Online sportsbook is their dime lines on every MLB game. The markets are deep as well, so you can find matches that are not available on other US-based sportsbooks. When it comes to promotions, Bet Online falls behind the competition. They do not offer a sign-up bonus, which became an industry standard in the last ten years, but they offer a lifetime guarantee of 25% bonus on every qualified deposit, if you use a promo code. Bet Online Sportsbook is worth checking out, especially if you like to bet on MLB and futures tennis. They are a trustworthy provider and even though you won’t get an additional value by claiming a welcome bonus, early lines and great odds make up for it.